Nowadays almost everything is wireless and you no longer have all those cables cluttering your workspace. 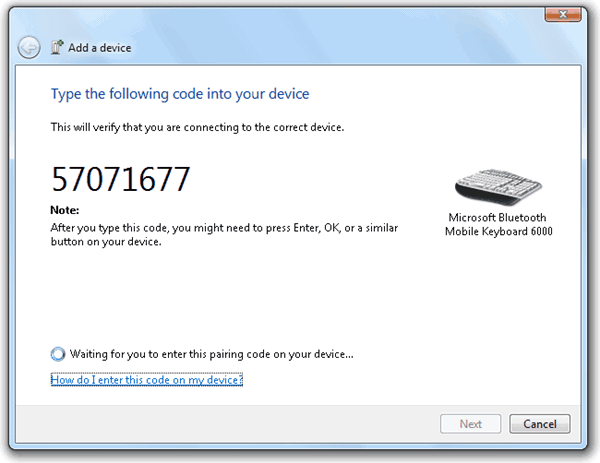 If you want to use a wireless keyboard, you should opt for one that supports Bluetooth (if your computer comes with Bluetooth) because it doesn’t require an additional receiver that uses an extra USB port. Being a fan of Microsoft keyboard, I found a slim and small keyboard sold by Microsoft called “Microsoft Bluetooth Mobile Keyboard 6000” that uses Bluetooth for wireless connectivity. Other than that, it is a shorter keyboard because of the separated number pad which will allow the mouse to be closer to my body. I immediately bought it and when I received the keyboard, getting it to connect to my Windows 7 laptop can be quite a challenge because it is not like a USB keyboard where it works right out of the box after you connect to a USB port. The keyboard comes with a printed guide with setup instructions but without any screenshots which can be a bit challenging for people who has never connected a device through Bluetooth. In fact, I’ve discovered an alternative method where you don’t need to enter a pairing code to connect. 1. 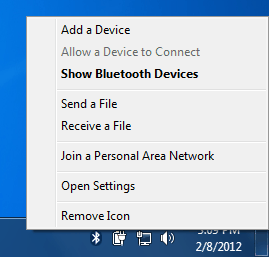 Right click on the Bluetooth icon at notification area and select “Add a Device“. 2. If the keyboard is not discoverable, press and hold the Bluetooth Connect button located at the back of the keyboard. 3. When the keyboard is found, click on the keyboard to select and then click the Next button. 4. The next window will show an eight digit code which you should type on the new keyboard and followed by hitting the ENTER key. 5. The Bluetooth keyboard should be installed and listed in Bluetooth Devices. 1. 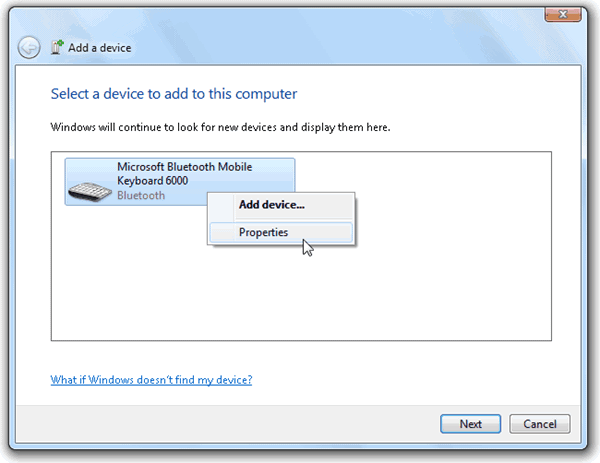 Right click on the Bluetooth icon at notification area and select “Add a Device”. 3. When the keyboard is found, right click on the keyboard and select Properties. 4. 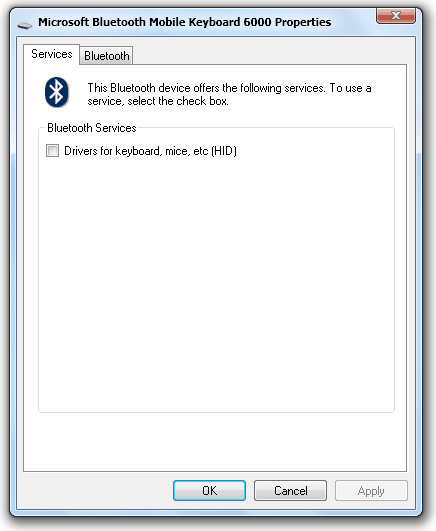 There will be a checkbox “Drivers for keyboard, mice, etc (HID)” under Bluetooth Services. Check it and click the Apply button. Wait for the installation to complete and then only click the OK button to close the window. It took too long to add this device. Devices usually stay in discovery mode for only a short period of time to prevent power drain. Try adding the device again. When I tried to use the second method, the Bluetooth Services under Keyboard Properties shows a blank panel. The keyboard uses 3 AAA alkaline battery which is included and when I changed to new batteries, the above problems is gone. So keep that in mind that weak battery can cause connectivity problems in Bluetooth keyboard. This is a great piece of advice. I was trying to connect the numerical keypad as well with no joy. Did you attempt this? Thank you very much for your advice. I finally connected my Logitech K810 after second shot. I need to restart once Windows 7 Pro (64 bit). It isn’t connected successful with my first try. Probably the main issue is short Bluetooth discovarable time. The second method, without paring code, worked when I couldn’t get the paring code method to work. Thanks! Just wanted to say thanks for the tip on batteries! Was connecting ok, but no Bluetooth Services showing up. The batteries were actually still full, but the keyboard hadnt been used in 2 years. Popped some brand new ones in and worked immediately! Saved me a ton of frustration and probably buying a new BT keyboard in the end! hi, thx ! this is the closest i have come so far to resolving my problem. However, on my fresh install ( windows 7 english Sp1 ), i cant get it going. i dunno what to do next ! i dont wanna throw th keyboard away, coz it cost me 40 bux ! please help me if you can !!! plus it connects much faster while paring compare to the NEW receiver…. Hi Raymond, not sure if you are facing the same issue and have a solution. – Go to bluetooth devices > Bluetooth keyboard > Properties and click on the ‘SERVICE tab’ and hit OK, so it makes the keyboard “wake up” and works again. But it is a pain to every time it loses connection have to do it to get it working back! I have checked the hardware tab and each power manage tab, but my Keyboard device HID is grayed out the option “The computer can turn off the device to save energy”. But it is unchecked as grayed out. So, if it is unchecked as grayed out seems to be ok, I mean not active to sleep/hibernate. I think it was changed in the regedit, but I can’t remember where, but it didn’t make difference in this issue. All hid device power energy are set to allow to wake up. Anybody knows or found a solution to stop loosing keyboard bluetooth connection? It is a non-branded keyboard and didn’t come with any driver and all drivers/hardware tab is set to allow to wake up. The bios is ok too regarding power saving. Thanks in advance. Any help I’ll appreciate.